You are currently browsing the tag archive for the ‘doctor’ tag. I had a really great appointment with my GP last week. I have only been seeing her for a short while so we are still getting to know each other, and it was great to feel that my hunch that she is really great seems to be ringing true. She spent a long time with me, and she does not rush me when I am trying to explain things which really helps me to concentrate and not forget important things, as well as it being less exhausting. She really listens and her response to things I suggest is usually positive, such as “yes, that is certainly something we can try” or “I will speak to a colleague/look that up and get back to you”. It really is a breath of fresh air after my last GP surgery. This time was really a drug review and a review of symptoms to find what combinations might work best. I have come away with plans to make several changes in my own time, one at a time and to experiment with what works best for me. She really treats me like and intelligent adult and is not patronising at all. It is so great. I also asked her about stretching and gentle exercise to maintain what function I have over the long-term. This was also related to the risk of osteoporosis of being indoors so much and not being physically active. She said that any movement is better than none, however small. I have been told before that stretching is pointless unless you can hold it for 20 seconds, and that doing exercises is also pointless unless you keep increasing the amount you do (like graded exercise therapy). My GP says she will ask a physio friend of hers about the best way to stretch very weak and trembly muscles, and how to build strength gently. She said I won’t be able to tell any difference for a long time as things will be so slow, which is a good attitude I think, rather than the pressured approach of people I have met before. I am willing to give it a try. I told her that I have a heart rate monitor and would wear it to be sure I was not stressing my body too much, and in order to keep my heart rate low I will have to do most of it lying down. She said that was excellent. I have dug out the exercise sheets given to me in the past by physios and the CFS management team, which I failed to do regularly before as the approach was not tailored to my severity. I just need to work out what I can actually do and also which things it is most important to focus my energy on, as I won’t be able to do anything on days where I am in recovery from doing something, or having a flare up: I need to choose wisely which stretches/movements will have most all-round benefit. She did say that even stretching would probably cause increased pain initially but not to worry about it if being very gentle. I hope that longer term I can reduce my pain levels through being a bit stronger and my muscles being less tense. I do think that there are various causes for muscle problems in ME and that it is just not possible to exercise all the issues away, especially nerve related issues. I can only see how my body reacts. I don’t think anyone should try to exercise unless they feel up to it, and I certainly will only be doing a little bit during my best time of day and on better days… I use the word “exercise” very loosely! It’s worth a try, even though there are other things I would rather be doing with my time and energy! I will be starting with just a few minutes so will just have to discipline myself… again. Maybe some stretching then a treat! She expressed concern that I am taking Norethisterone (progesterone pill) all the time to stop my periods. She said she would like me to talk to a nurse specialist before deciding whether to continue with it long-term or to see if there was a better solution. I am happy with that as I was not sure what the long-term plan is, as when my old doctor brought up the subject, I wrote to him to explain how I saw it and it was never followed up. I hope this doctor will be more thorough, she seems so on first impressions. I don’t want to return to having periods, certainly not if they have the same impact on me as they did, but I am happy to check out the options. I did ask if there was anyone with other ME patients, or who had some knowledge of it, and she did say that no-one would have specialist knowledge as it is a rare condition. I questioned how rare it is, and said there are more people with ME than MS, and she said MS is rare too! (I am sure they are both rare, but I bet they all know more about MS… obviously I did not say this). I know they won’t have specialist knowledge, but it would be nice if they are willing to learn a little. We shall see. I will see the nurse, then make another appointment with this doctor to see if we can get to talking about more specific things. I have symptoms I have not even mentioned to a doctor before so maybe I will get to that. It’s early days, but I am glad I have taken the plunge to try someone new. At least I was not spoken to like I was a child; so old doctor 0 – new surgery -1 on that score. Just been to visit my GP. (A primary care doctor, for those not in the UK – basically the “family doctor”). He is the one I have (had) settled for from the three available at my local doctor’s surgery to be “The One”. So I went in and tried to talk to him about what to expect from a GP and ask him if he is willing to be “The One”. He turned it around and asked what I want from a GP, and I said I wanted someone to have a broad overview of my situation and I wanted to be able to discuss symptoms even if there was no obvious treatment, and that I wanted to understand my symptoms as well as possible. Also that I was not looking for a drug for each thing, more the understanding. This may not have come out very clearly, or actually be the coherent description of what I do want/expect, but I was not prepared for the question, or feeling very articulate. I still don’t know what he feels he can offer, but I am getting an inkling. He basically responded by saying that he cannot help me with the understanding and needs to refer me to the specialists for that. He says my muscle issues sound like ME so I need to see the ME/CFS specialist for that. That is fine, but I voiced my concern that he would only want me to go back to the CFS Lifestyle Management Group and that I do not want to go back, as I felt I had taken what I could from it and going to appointments is hard. He gave me a long lecture on being open-minded (including an analogy to driving a car and building up bad habits). I tried to clarify my experiences (as surely I know more about them than he does!) but to no avial. He just wants me passed on to someone else, it seems. He also said that this CFS specialist can refer me to the Pain Management Clinic (PMC), as if he (GP) does it and I just turn up they will not know what to do with me as general approaches won’t be specific to my condition, but if the CFS specialist refers me it will be different (I am not sure about this logic – it’s just a referral letter). Seeing as the suggestion came from the POTS specialist, that means I am now seeing three people before getting to see that PMC. Wierd. He did not really respond to me wanting someone to have a broad overview of my condition. When I was trying to answer his question about expectations, I gave him the example of my nerve pain and he cut me off saying he wanted general, not specific expectations. Hello? Let me finish my sentence. Try to understand what I am saying. Understand that I have cognitive issues. Stop trying to rush me into conforming to your model of what the conversation should be. This was not helped I think by the fact that we had booked a double appointment but the receptionist had obviously not registered this so we had the impression we had longer than he thought. He started talking about booking a double and we said we had and then he said we needed to repeat our request to make sure (another lecture given) as if it was our fault, when my partner says she was very clear about it. I also got the lecture I have had before from GPs as I mentioned I had seen nerve pain talked about in relation to POTS on a forum. Instead of trying to understand why I might use the internet, or giving me credit for being an intelligent person and being able to distinguish opinion from fact etc etc, I got the patronising talk about the dangers of finding information on the internet. If he is so uninformed (says he does not know that much about ME) when where am I supposed to go? Eh doc? I think GPs should know more about such a common condition and frankly, they should go online and read some recent research, as they are obviously not getting very good info from the BMJ/NICE. He did say he was happy for me to give him supporting info when he had to write reports for benefits etc so that he has an idea of my situation, and instead of saying he would like to know more about it in person, he started on about the double appointments, how many hours he works, how he is not always available! Ok then. So I have a referral to the CFS specialist and I am to go back for a double (repeat DOUBLE!) appointment in a month. While I think he is happy to see me more often, he certainly has his own communication style which is not supportive or condusive to building the kind of relationship I would like, you know, where I am listened to!?! These are interviews I did (by email) with two friends with FM as part of my blog for ME/CFS/FM Awareness Day 2010. They are in their own words. To read the main post, click here. I’m a 54 year old woman, divorced with two grown up sons. How long have you had FM? How does it affect you now, what are your main symptoms and has it changed over time? I’ve had fibromyalgia for almost 12 years. Since coming to live in Spain 5 years ago my condition has been a lot less of a burden. Largely as a result of the climate –sun and warmth make an enormous difference, which in turn means I am able to walk and move about more easily on a regular consistent basis and am therefore less stiff. In addition the pace of my life here is much slower, the general rhythm of the day is more relaxed. I also live on the coast which means I don’t have to deal on a day to day basis with hilly terrain, and living in a small flat cuts out the need for using stairs many times in a day, and is also a more manageable space re housework, cleaning etc. The symptoms are many and variable – ongoing pain in some part of my body – somedays, knees, and hands other times neck and shoulders, sometimes one side of the body another day the other. The worst is the sense of fatigue that comes on very suddenly, and unexpectedly, often a result of overdoing things or as a direct result of stress and anxiety – even re minor things eg if washing machine breaks my stress levels are completely out of proportion with the incident and any anxiety affects my body and its capability profoundly. I am certainly not as ill as I was 5 years ago but that is because I have drastically changed my lifestyle – when I return to cold weather or stressful situations my symptoms are exacerbated. It’s also hard to know how much the symptoms have changed because over time living with pain – I have learned to shut out sensations of pain, if I didn’t do that my life would be miserable. What was happening at the time you became ill? Do you have a theory about what caused it/triggered it for you? The onset of illness was very sudden and acute. However I was overworking and caught a virus which caused inflammatory arthritis in all joints of my body – I was confined to bed for many months unable to walk, move etc the doctors told me that the fibromyalgia was a direct result of the continued acute pain suffered during the course of this illness . So in my opinion the overworking/ stressed lifestyle lowered my bodily resistance making me victim to a nasty virus – I agree with the doctors that the virus caused arthritis and fibromyalgia set in as my body was unable to deal with the ongoing pain. What changes have you made to your life to accommodate it? I have completely revolutionized all aspects of my life. I have had to change not only the things I do and the manner in which I do them but also my attitude to life. I have had to become much more selfish in relation to my life, and much more discerning re what I do and when I do it – I live alone now as it is easier for me not having to cope with the practical and emotional demands of other people —-I now please myself and am answerable to no-one. I have to work hard at always retaining a positive attitude. I have had to recognize, come to terms with and accept the severe limitations that the condition brings but to be happy within those limitations. Is there anything that has helped you to cope with it? (Either prescribed medication or something else). Acupuncture, hydrotherapy, gentle regular non aerobic exercise eg walking cycling swimming. And plenty of rest. Counselling helped me enormously to come to terms with what I couldn’t change and the strength to change what I could. As for prescribed medication eg ant inflammatories, analgesics, sleeping medication – I personally now only resort to taking medication if it is an emergency as the long term toxic effects of ongoing analgesia are in my opinion counterproductive. When in pain I try everything from application of heat or cold, yoga, just lying and resting and waiting…. How do you understand it and how do you describe/explain it to others? It’s a complex syndrome which affects the nervous system and pain control mechanism of the body, its also a metabolic disorder in that the muscles burn up ATP very fast hence creating the symptom of fatigue. How closely do you think it is related to ME/CFS, if you are familiar with what that condition involves? What do you see as distinct/different? I think there is a definite relation between these types of disorder not so much in the symptomology as in the cause. What other diagnosis/conditions do you have alongside FM? Do you think they are related to each other? I think I answered this re having low resistance virus arthritis = ongoing pain = fibromyalgia develops as a result. When and how were you diagnosed? Did you know what FM was before that? Did you have to fight to be diagnosed or was it straightforward? Did you match all the tender points? Do you think these are a good indicator of having FM? Are there any good web sites/other resources that you would recommend to people wanting to know more about FM? In the early stages of the illness I found the British Fibromyalgia web site very helpful and their printed information and leaflets were invaluable in helping family and friends understand what you were going through. I would say find as much info as you can – learn to undersatand the mechanics of the illness and accept that life cannot continue being the same you have to change irrevocably and only you can determine whether that change is a positive one or a negative one. Is there anything else you would like to say about life with FM? You have it. There’s no cure. Learn to live with it. Do everything you can to be as comfortable and happy as you can whenever and as often as you can. Don’t let it defeat you psychologically and spiritually. I think I’ve had FM for a very long time. Sometime in my twenties I realised that everywhere on my body hurt if I pressed it. In my late twenties I started to get muscular pain after small exertion. I was always at the doctor’s or the osteopath. But even earlier, in my teens I can remember being in agony after exercise and wondered why everyone else didn’t seem to be as affected. I put it down to not being very fit. Now, my main symptoms are fatigue, muscular stiffness, joint stiffness and pain in the most used areas – across my shoulders and lower back. If I get into a good place with my energy levels and do too much I can be in a great deal of pain with my whole skeleton feeling like it is lit up. Thankfully that doesn’t happen too often. For me, stress seems to be the trigger. I have always been very stressed and have had emotional difficulties all my life. I store tension in my body and have problems releasing emotion. If I have massage or other body therapies it can be upsetting for me as memories and emotion can be released that way. Well, the fibro on its own wasn’t too bad for functioning. I had to be careful about sitting at a computer for long periods of time, spent a lot of money on osteopaths and massage, tried to make sure I kept supple through swimming and pilates and so on. It was when the fatigue really kicked in that the problems started. I had to give up work. Everything changed. I used to drink alcohol which is a great muscle relaxant, but that has its own problems. At one point I used to get strong, codeine based painkillers from the doctor, and developed a bit of a habit. Not a good way to carry on. Once I had a diagnosis it became easier and I stopped self-medicating. Now I take low-dose amitriptyline and low dose SSRI antidepressant. The two together really help pain and sleep. Paracetamol is good for bad days and can help stop me building up into a pain crisis. Prevention is much better than cure and I’m much better when I do my Pilates stretches in the morning. I also regularly do a body scan meditation for relaxation, and I rest three times a day for at least half an hour. I don’t generally explain the pain. I’m more usually trying to explain my fatigue and walking difficulties as they are much more visible. Sometimes my partner asks me if I’m ok and I just mutter ‘in pain’. It’s so familiar to me that I accept it like breathing. It’s just part of me. I understand it as a holding on of tension, my body’s complaint against having to do the work of my faulty emotional processing. I think they are one and the same; all part of the same continuum. The FM is, for me, at the sharp end of the wedge. 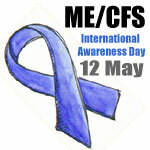 It belongs more to the earlier onset of my ME/CFS. The fatigue, or thick end of the wedge is where my body has been holding this tension for so long it is having to stop. I know when I’m improving because I get less fatigue and more pain. Hmm, let’s see. Irritable Bowel Syndrome, Osteoarthritis, Post-Traumatic Stress Disorder, Depression, Anxiety, Generalised Anxiety Disorder. I feel they all stem from the same cause which is extreme and repeated stress. I was just on the cusp of moving into the fatigue stage of my illness. I met someone who had just received a diagnosis of fibromyalgia and whose symptoms exactly matched my own. It was a further four years before I could get a GP to even entertain the idea I had FMS. A rheumatologist I saw did not ‘recognise the diagnosis’. After I moved to a new area I asked to be referred to a rheumy I knew was sympathetic. He wouldn’t see me because I had fibromyalgia and they could do nothing for me! I burst into tears in front of my new GP and tried to explain I had diagnosed myself and it was an official diagnosis I wanted. To cut the wait and frustration I paid to go and see the same guy who had refused to see me. Through that meeting I got my diagnosis of FMS/CFS and a referral to an ME clinic. He quickly checked my tender points and said I wasn’t too bad. It wasn’t till I left his office the pain kicked in from just having them pressed. I don’t know if they are a good indicator or not. Probably a better indicator is widespread, long-term pain with a normal rheumatology blood test. My feeling is that sustained emotional stress, especially in childhood, results in real physical symptoms and the breakdown of metabolic systems in the body. My experience of it is that some recovery, even total recovery, is possible. It’s real, it hurts, it can be very disabling, not to mention frightening at times. Sitting up was hard and i had to haul myself up, and then got even hotter. A lady across the waiting room told the nurse i was in distress and she came and sat with me (was amazed at the heat radiating from me!) and gave me two glasses of cold water and that helped. I thought it probably looked like i was having a panic attack so i explained that i have ME and POTS (and briefly what that was). She was very nice. She then had to help me along the corridor to the doctor’s room. The doctor helped me back along and rang my taxi home and the taxi driver was really nice to me. I feel a bit better now, but still very weak/lightheaded and my lower legs are very heavy/achey.